Georgiy Antonovich Gamov was born on March 4, 1904 by cesarean section on a table in his father's library in Odessa then part of the Russian Empire (now in Ukraine). Both of his parents were teachers; his father taught Russian language and literature at a boys school and his mother taught geography and history at a girls school. His maternal grandfather was the archbishop of Odessa and his paternal grandfather was a commander in the Russian Army. At age six he saw Halley's comet from the rooftop of his family's building and from astronomy he became interested in physics. The Russian Revolution struck while he was a student at the school where his father taught which was frequently closed due to street fighting. He graduated in 1920 and went on to Odessa State University, but was unable to study physics there due to the privations caused by the revolution. In 1923 he went to the University of Leningrad (now St. Petersburg State University). There he studied under Alexander Friedman, however Friedman died in 1925. While studying conventional physics at the university Gamow met with other students to read the papers coming from western Europe that were defining the new science of quantum mechanics. Gamow was interested in the new theories and sometimes neglected his studies in classical physics. In 1928, after being admonished for unsatisfactory academic progress, he was given a fellowship which allowed him to go to Germany. Gamow traveled to Gottingen, where he studied under Max Born at the Institute for Theoretical Physics. While there he authored a paper explaining why radioactive nuclei emit low energy alpha particles, but when bombarded by alpha particles of higher energy they are not incorporated by the nuclei. Alpha particles are a product of radioactive decay composed of two protons and two neutrons, a helium nuclei. After four months in Gottingen Gamow's money ran out and he headed home. On the way back to Russia he stopped in Copenhagen, Denmark where he ended up staying for eight months. While there he had the chance to present a paper to the Royal Society of London, quite an honor for a 25 year old scientist. After Gamow returned to the Soviet Union he decided to leave due to the increased political repression. In 1932, after three aborted attempts to defect, which were not noticed by the authorities, he was granted passports so that he and his wife, Rho, could go to a conference in Brussels. After the conference Gamow tried to find work in Europe. He did get a few temporary positions but it was not until 1934 that he could find a permanent position at George Washington University in Washington D.C. In 1940 Gamow was naturalized as a U.S. Citizen. He remained at George Washington University until 1956. Despite his knowledge of atomic physics during the Second World War he did not work on the Manhattan Project, but stayed at Washington University and did some consulting for the United States Navy. In 1954 he became a visiting professor at the University of California at Berkeley and in 1956 he took a position at the University of Colorado at Boulder, where he remained for the rest of his career. 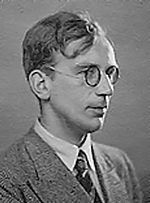 Gamow studied beta emission, the emission of an electron by a radionuclei and nucleosynthesis, the creation nuclei larger than a single proton (hydrogen) inside stars. Stars are powered by atomic reactions such as hydrogen forming helium and releasing energy. Helium, with its two protons and two neutrons, then is used to form even numbered atomic elements (beryllium, carbon, and oxygen). Gamow worked to popularize the big bang theory, the theory that the universe and all the matter in it was created in a big bang. Gamow's most important work in astrophysics was on understanding the generation of red giants, stars that have exhausted the supply of hydrogen at their core. When the reaction producing helium stops the core collapses due to gravity. The conversion of hydrogen into helium continues in the region surrounding the stellar core, which expands creating a red giant star. After the 1953 discovery of the structure of DNA Gamow attempted, unsuccessfully, to solve the problem of how the genetic code translates into proteins. Gamow was also an award winning writer of both scientific and popular books. The physics tower at the University of Colorado, in Boulder is named after him. Gamow died on August 19, 1968.